Frozen 2 Update: ‘The Rock’ To Voice Sven? 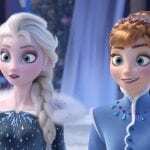 We are well into the new year and Disney Animation aficionados will most likely know what this year’s big tentpole animated extravaganza is: Frozen 2. While details have been scarce save for an unconfirmed leak, we now know that the voice cast is officially gearing up for what will surely be a blizzard of appearances and news updates. The year’s first official glimpse at Frozen 2 came today as Idina Menzel (voice of Elsa) and Josh Gad (voice of Olaf) shared pictures to their Instagram accounts, most likely taken from a cast reunion. Both pictures feature Menzel, Gad, Kristen Bell (voice of Anna) and Jonathan Groff (voice of Kristoff). Notable about Josh Gad’s post is his interesting choice of Instagram user tags. Gad tagged Menzel and Bell, sure enough, but also Santino Fontana (who voiced Hans in the first film) and, mysteriously enough, Dwayne ‘The Rock’ Johnson. Even more interesting, Gad placed The Rock’s tag just over the plush figure of Sven. Which raises some very interesting questions. Will Dwayne Johnson be voicing a character in Frozen 2? Will Dwayne Johnson be voicing SVEN in Frozen 2? Will Sven the reindeer be speaking in Frozen 2? Is Prince Hans of the Southern Isles back in Frozen 2? Dwayne Johnson is no stranger to Disney Animation, as he voiced the iconic character Maui in 2016’s Moana. Let the speculation commence, Frozen fans! We’re just getting warmed up…or rather, based on where you currently live…frozen too.